Is the order a rabbit?? Wonderful party! / ご注文はうさぎですか?? Wonderful party! / Gochuumon wa Usagi Desu ka?? Wonderful party! 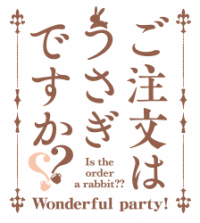 Is the order a rabbit?? Wonderful party! Is the order a rabbit? / ご注文はうさぎですか? / Gochuumon wa Usagi Desu ka? PS VITA「ご注文はうさぎですか？？ Wonderful party！」 2016年3月3日発売予定! !